LED lighting has been around for 40 years. What do the latest pool lights have to offer? LED’s convert 90% of the energy that they use into light. That makes them by far the most efficient light source available and changing to LED lighting in your pool will significantly reduce your running costs and the associated carbon emissions. Of course, saving money and being more eco-friendly is a much more attractive option if you also have a really well lit pool. A pool lit from one wall to the other. A Dutch company called EVA Optic has just entered the market in the UK with a range of domestic pool lighting that has been developed from their background in designing lighting systems for international competition swimming pools. As you can imagine, an Olympic sized pool is much harder to light than the average domestic pool. In facing those challenges, EVA produced a range of high-powered, compact LED lights that are brighter than standard lights and have a broader beam. They can light your pool brightly and evenly from one wall to the other while using an eighth of the power of a 400W halogen bulb. One of the big attractions of LED lighting systems is their ability to produce an almost infinite range of colours and pre-programmed effects. EVA Optic units are DMX-ready. DMX is the control system that produces these mood-enhancing displays of colour and intensity. A digital controller can be pre-programmed to change your pool lighting from a soft and relaxing mood to a party atmosphere at the touch of a button. EVA units even have an advantage in this area too, as some of their fittings come equipped with four LED colours; red, green, blue and white where as most pool LEDs don’t have a white bulb. The fourth bulb allows you an even wider range of effects and lighting styles. EVA’s ‘Intelligent Power Control’ means that the brightness of the light is retained even when only one bulb is turned on while other LED fittings become dimmer under these circumstances. As a final benefit, the power supply and driver for EVA’s lights is mounted in a single fitting outside the pool which makes them more reliable and makes any technical maintenance that needs to be done much simpler. 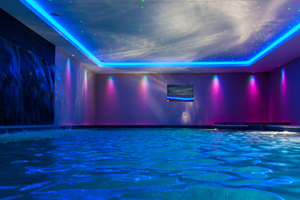 EVA Optic lighting can either be specified for a new build or retro fitted in an existing pool. We hope you have enjoyed this article and found it useful. To find out more about EVA Optic lighting or find a dealer in your area, please use the contact box below.